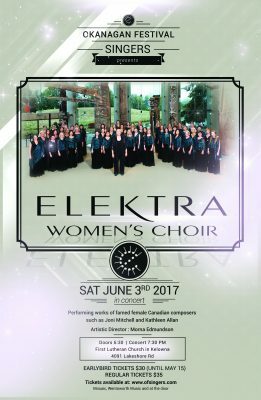 Elektra looks forward to appearing as the guest of the Okanagan Festival Singers at the First Lutheran Church (4091 Lakeshore Rd) in Kelowna, on Saturday, June 3rd at 7:30 pm. Click here to purchase tickets! Calling all conductors of women’s choirs! → ← Elektra places first in category at National Choral Competitions!